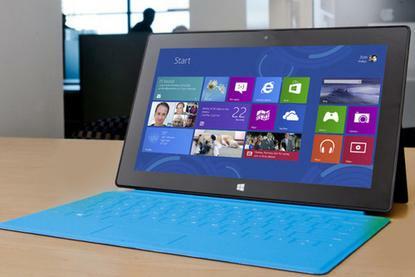 The Surface RT can replace a Windows PC for many users. The Surface RT isn't for everyone. It can't run traditional Windows software, so businesses or users that depend on specific applications or custom software can't just toss out their PC and use a Surface RT. For a variety of use cases, however, a device with email, Web access, and Microsoft Office is sufficient. The Surface RT includes Word, Excel, PowerPoint, and OneNote. With Windows 8.1, the Surface RT also gets Outlook, and Microsoft just updated the OneNote MX app to allow it to connect to Office 365 accounts. Microsoft has also made many of its tools available across iOS and Android, but the integration of the Surface RT with Microsoft software and services sets it apart from other mobile devices as a business tool. It's true a business can supply users with standard Windows laptops--with the full Windows operating system, more internal storage, a real keyboard, and possibly a DVD or Blu-Ray drive--for roughly the same money. But when it comes to weight and battery life, no $500 laptop can come close to what the Surface RT has to offer. Many businesses are purchasing tablets for users to use in addition to their standard desktop or laptop PC. In that case, you have to consider the cost of both the PC and the tablet. A Surface RT, on the other hand, can conceivably function as both and allow the business to cut IT costs while giving employees greater flexibility and mobility at the same time. Let's face it, small and medium businesses need professional-grade networks and PCs, but most don't have dedicated data centers and many don't even have full-time IT staff. They rely on simple, cost-effective technology. The Surface RT can augment a Windows PC better than other tablets thanks to Windows 8 and the tight integration with Microsoft software and services, and--for the right users--the Surface RT can be a primary device that fills the role of both PC and tablet in one.